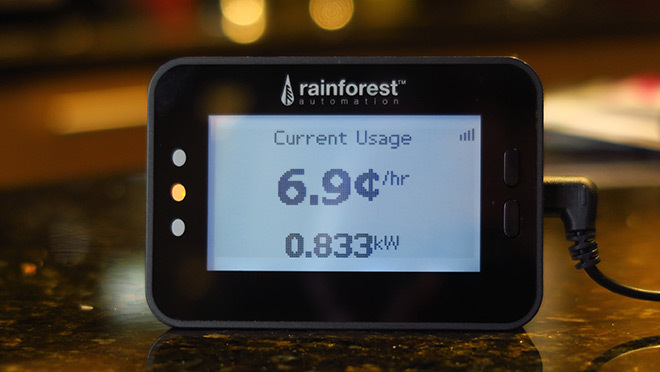 Paul DeMara of North Delta uses a Rainforest EMU-2™ energy monitor – available through BC Hydro – to get real-time feedback on his electricity use. Five years ago he replaced all his incandescent bulbs with LEDs, and his BC Hydro bills are significantly lower because of it. When Paul DeMara contacted BC Hydro five years ago, he was a pioneer with a plan. Armed with a meticulously-prepared spreadsheet and a lust for technology, he made the bold calculation that he would save $11,000 over 20 years by replacing 124 incandescent bulbs in his North Delta home with energy-saving LEDs. So we checked the math with one of our engineers, who confirmed that the numbers looked correct and that DeMara stood to pay off his brash investment in LEDs – $3,000 – within four years. DeMara says his typical power bill before his switch to LEDs five years ago was about $120 to $130 a month. “Now I’m typically at about $55 or less,” he says. While DeMara admits to having more than the typical number of audio and other devices in the home – “I’m a techy guy” – his bill doesn’t include heating. He uses gas for his heating, and managed to cut those costs, too, by installing a super-efficient gas furnace a few years back. Vital to DeMara’s projection of $11,000 in savings over 20 years is the much longer life of an LED bulb. Most ENERGY STAR® LEDs are expected to last 20 years or more under typical usage, which means it will be a long time before he has to pay money to replace a bunch of LEDs. Not all LEDs are created equal. Look for the ENERGY STAR symbol and check the life expectancy information on the package. Before DeMara bucked up for his all-LED swap five years ago, he did research into colour temperature in LEDs. He has selected lighting to ensure it fits the mood, and tasks, of each room. And in one room, he has the ability to program and change the mood via his smartphone. DeMara opted to go with a series of dimmable, colour-adjustable, Philips Hue lights in a downstairs room where he and his wife hang out, listen to music or play poker. Choosing light temperature is about personal taste, and DeMara declares up front that he’s no fan of the “daylight” temperature bright blues known as cool colours. He chooses 2700K (“A warmer, nicer look”) for the bedroom, and 3000K for the hallways, living room and kitchen. And because he has read plenty about how bright lights can interrupt sleep, he has installed a series of red LEDs to give a bit of light on the ceiling of the bedroom – “Just enough to make our way around at night” – plus a one-watt LED in the ensuite bathroom that stays on all the time and which costs him an estimated five cents a month. “You’re probably going to be looking at that LED light you just bought for 20 to 25 years, so why not get something that produces nice looking light?” he says. As a rule of thumb, he’s found that if a manufacturer doesn’t indicate CRI on the packaging, it’s likely that the CRI is usually low. “You get what you pay for,” he says. And if he has one tip above all, it’s to set up as many bulbs as possible with dimmers.